Good news after Songkran Festival Holiday! 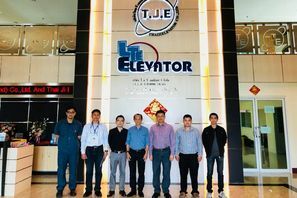 Thai Ji Elevator Co.,Ltd. would like to express gratitude towards Mr. Autthapol and representatives from Winconsult Co.,Ltd. 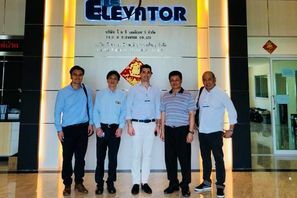 for introducing Mr. David Queral from Fermato Co.,Ltd., largest manufacturer of automatic doors and spare parts for lifts in the world, to Mr. Li-Lang, Lin (President of Thai Ji Elevator CO., LTD.) and having opportunities to learn more about their products. 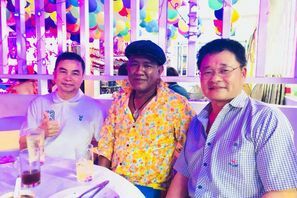 Mr. Li -Lang, Lin (President of Thai Ji Elevator CO., LTD.) and Mr. Chalermchai (Senior Sale representative) are very pleased to be invited to join T-COM Night Party of T-com System Co., Ltd. to celebrate their 12th year anniversary at their new factory site on 20th April, 2018. Welcome PENN Holding CO., LTD to our factory. PENN Holding CO., LTD and users from Lam Ta Khong Power Plant, Pakchong District, Nakhon Ratchasima Province visit and inspect the products to prepared for delivery at our factory.